To analyse the basic precipitating causes of the patient's problem and aim at alleviating those causative factors. It is very common in persons above 50 years of age and those who have got to do work like typing or persons who have to keep the neck in one position as in reading, writing and other table works. It starts with degeneration of disc resulting in, reduced space in between two vertebrae, later osteophytes are formed in the periphery. This is followed by involvement of the posterior intervertebral joints resulting in pain in the posterior part of the upper limb. Generally, this pain is along with tingling, numbness and radiating in nature. The osteophytes formed may also compress the cord which will produce weakness of whole of the limb. Faulty posture adapted is associated with wrong habits, anxiety and mental tension. a) Officers, typists and others working on poorly and wrongly positioned desks and tables. b) Drivers prone to prolonged driving. c) Coal miners and divers. d) Persons involved in occupations including lifting and carrying things on their head. e) Habit of holding phone on one shoulder while talking. f) Sleeping in awkward positions, using inappropriate pilows. Built of the body Persons having thick neck with a Dowager's Hump and long backs are much prone to spondylosis. 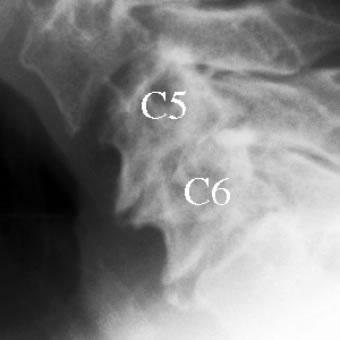 The segments commonly affected in the cervical region are C4 to T1. Along with these sites, other parts of spine are also affected due to compensatory adjustments. 1) Onset: The condition gets precipitated by fatigue, mental tensions, worries, anxiety or depression. It occurs gradually due to faulty posture. 2) Pain: The region of pain depends on the site where the cervical spine is affected by the pathology. c) Region from C4 to T2- Radiating pain; pain in shoulder girdle, shoulder and arm, either unilateral or bilateral. 3) Muscle weakness: Depending on which nerve root gets compressed, the concerned muscles that are supplied by that nerve root gets affected and weakened. Usually, the postural muscles of the neck are weak. They are: upper cervical spine flexors, lower cervical spine extensors and side flexors. 4) Sensation: There occurs paraesthesia that means, pins and needles or altered sensation of the particular dermatome which is supplied by the impinged nerve root. 5) Nature of pain: Usually described as dull, aching pain, sometimes gets exaggerated as sharp, stabbing pain and frequently occurs as cramping type. 6) Limitation of movement: All the neck movements get limited, often bilateral but is unilateral in case of acute onset of pain. The movement which gets very much limited is flexion of the upper cervical spine and extension of the lower cervical spine. 7) On palpation: It is detected that there is loss of mobility of soft tissues along with loss of movements of the accessory intervertebral structures. 8) Muscle spasm: There is spasm mostly of the scalene muscle usually unilaterally. As the middle and lower fibres of trapezius get lengthened and reduced in tone. Imbalance results causing the upper trapezius to bear increased tone and hence there occurs muscle spasm and muscle tightness. Stress at C5,C6, so tightness of upper cervical spine extensors. Flattened, sometimes lordotic lumbar spine. Flexion of elbows and hand. Hip flexed and knee flexed. 10) Cervical spondylosis is usually associated with headache, vertigo and loss of balance which is due to postural changes. a)Hot packs for moist heat. b)SWD (pulsed or continous) for dry heat. Once the pain subside to a tolerable limit, then exercises should be started and progressed gradually according to the conditions and requirements of the patient. Isometric contractions of the cervical muscles improve the muscle endurance and tone as the contractions improve the blood supply thereby the nutrition to the muscle is increased and hence muscle strengthening is done. The basic technique of this exercise is that both Physiotherapist and patient exert equal pressure so that static; non dynamic action takes place in the cervical muscles. During all the movements, shoulder girdle should be stabilised so as to avoid trick movements. The pressure can be applied by the physiotherapist or by the patient himself after teaching him the technique properly. Kneading helps to release tightness of upper fibre of trapezius. Picking up, wringing and skin rolling also helps in relieving the tightness of scalene muscles, interspinous ligaments, paravertebral muscles and trapezius. Oscillatory traction is considered to be effective in mobilizing the stiff neck. Continuous traction is used to relieve nerve root pressure. Traction is always given in comfortable position with minimum weight which should be graduated slowly as for the patient's recovery. This depends on the frequency of remissions and exacerbations of the condition. It can be given in sitting or lying position. The traction can be given either in the form of manual traction or positional traction. Float support lying in warm water is best for total relaxation and hence gain relief of muscle spasm. To relax the upper fibres of trapezius, patient is taught to push one hand then the other towards the feet in the float support lying position. For the lower fibres of trapezius and serratus anterior, sitting on the float with both hands holding down the float is the preferred position. This also stimulates the muscles and the receptors of the neck and shoulder joint to hold the head in a good position. As the condition progresses, the abnormality of posture also increases, thus from the initial stage itself, postural awareness through proper advice and education should be planned and initiated by the physiotherapist. The ideal posture is straight neck with chin tucked in and back straight with no compensatory actions or any trick movements. While sitting a high backed chair is provided to the patient with head, neck and shoulder supported; a small pillow in the lumbar spine, feet properly supported and arms resting on a pillow over the lap or on the arms of the chair. While sleeping, side lying is the most preferred position, supine lying is also advised. A single pillow under head for head support is allowed. A Butterfly pillow is the best support for a patient of cervical osteoarthritis, as it is flattened in the middle where the head rests and the elevated ends support the head on the sides. Support for the neck are of great importance to keep the neck steady and to relieve the pain. A firm neck collar is very beneficial especially during activities or during travelling. While patient is resting or sitting, the collar should be removed but then also the neck should be supported by pillows or head rest. Due to pain and spasm of cervical muscle, patient is always in discomfort and uneasiness. So to alleviate these undesirable situations, relaxation techniques are taught in various positions that is during rest, work or play. While lying on bed, patient is adviced to loosen his entire body and stretch for few times so as to reduce the muscular tension to a minimum. While relaxing the whole body should be fully supported by pillows. He is then encouraged to think of something pleasent which will facilitate comfortable and relaxed sleep. Surgery may be necessary for a patient suffering from cervical osteoarthritis if he/she has severe pain that does not improve from other conservative treatments. It should be the last resort as there is always a risk factor involved. Kieran Michael Hirpara, Joseph S. Butler, Roisin T. Dolan, John M. O'Byrne, and Ashley R. Poynton. Nonoperative Modalities to Treat Symptomatic Cervical Spondylosis. Adv Orthop. 2012; 2012: 294857. Almeida GP, Carneiro KK, Marques AP. Manual therapy and therapeutic exercise in patient with symptomatic cervical spondylotic myelopathy: a case report. J Bodyw Mov Ther. 2013 Oct;17(4):504-9.